Hundreds of Pakistani ATM subscribers have become the victim of ATM skimming frauds and more than one crore rupees have been illegally withdrawn within a couple of weeks. Habib Bank Limited (HBL), one of the affected banks, has confirmed that ATM machine from several locations at Karachi and Islamabad were targeted. Federal Investigation Agency (FIA) immediately took the notice of the complaints – and it has started an investigation against the culprits that are behind this horrendous crime. According to the sources, more than crore rupees of around 600 customers have been lost until now. The recent ATM hacking attempts are not first of its kind in Pakistan, as previously we came across some similar incidents but marginal in number and a smaller amount of money was stolen. How ATM card skimmers steal your information? 1. The first technique hackers use is to put a fake card-reader over the card slot. When you insert your card, the device copies the data on the magnetic strip of your card and stores the data. 2. Another technique is the use of a camera. A small camera is placed in a position to capture your PIN. The hidden camera records your PIN code and conveys it to fraudsters. How to keep yourself safe from ATM theft? 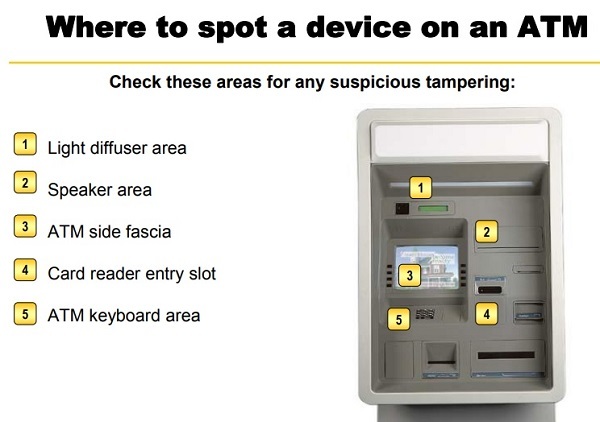 Here are some ways to follow to avoid your ATM information getting hacked. Using your hand to shield the ATM keypad when you type in your security code is one of the simplest and effective ways to prevent ATM hackers from stealing your passcode. Criminals usually use a device called “skimmer” to steal payment card data. This device is placed on the “swipe” or “dip” port on an ATM, from where it reads the magnetic strip on your card and rip its data. Close inspection of a compromised ATM should reveal if it has a fake keyboard, fake card-reader or cameras. Using ATMs less frequently will lessen the risk that you’ll encounter a bad machine. Try to use banks, internet baking or mobile apps for transaction. If you suspect that something unusual, such as a poorly fitted ATN card-reader, immediately call your bank. Timely reporting is essential in cases of fraud, so be sure to keep an eye on your debit and credit card transactions.